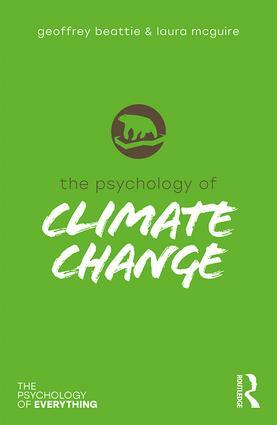 The Psychology of Climate Change explores the evidence for our changing environment, and suggests that there are significant cognitive biases in how we think about, and act on climate change. The authors examine how organisations have attempted to mobilise the public in the fight against climate change, but these initiatives have often failed due to the public’s unwillingness to adapt their behaviour. The book also explores why some people deny climate change altogether, and the influence that these climate change deniers can have on global action to mitigate further damage. By analysing our attitudes to the environment, The Psychology of Climate Change argues that we must think differently about climate change to protect our planet, as a matter of great urgency. Chapter 3 - Cognitive biases in our thinking about climate change. Chapter 4 - Climate change initiatives, and why they failed. Chapter 5 - Assessing our real attitudes to climate change. Chapter 6 - How might we change underlying implicit attitudes? Geoffrey Beattie is Professor of Psychology at Edge Hill University and in recent years a Masters supervisor on the Sustainability Leadership Programme at the University of Cambridge and a Visiting Professor at the Bren School of Environmental Science & Management at the University of California, Santa Barbara. He has a First Class Honours degree in psychology from the University of Birmingham and a Ph.D. in psychology from the University of Cambridge. He was awarded the Spearman Medal by the British Psychological Society for 'published psychological research of outstanding merit' and the internationally acclaimed Mouton d'Or for his work in semiotics. He is both a Chartered Psychologist and a Chartered Scientist. He is also a Fellow of the British Psychological Society, a Fellow of the Royal Society of Medicine and an ex-President of the Psychology Section of the British Association for the Advancement of Science (B.A.). Laura McGuire is a Postdoctoral Research Assistant in the Faculty of Education at Edge Hill University. She was a Research Assistant at the University of Manchester from 2007 to 2011 and then worked as a Research Assistant at the Sustainable Consumption Institute at the University of Manchester from 2011 to 2012. Her research focus is on possible psychological barriers which prevent people living a more sustainable lifestyle in the context of the threat posed by climate change and tackling this very major issue from an interdisciplinary perspective.